I have been struggling with this picture for several weeks. I have sat down at several lunchtimes and tried to get this going but have either been distracted by other things or just not quite known what to do with it. 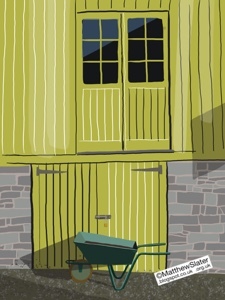 The scene was taken from a photo I took in the village of Clun in Shropshire a few weeks ago. In the end I just sat down and filled in a few basic lines and decided to leave it at that. I don't like leaving things unfinished and now I feel I can move on to something else.